Is Kojima Working on Lords of Shadow? The stream of vague reveals and teases regarding Hideo Kojima's next game continues to trickle out. 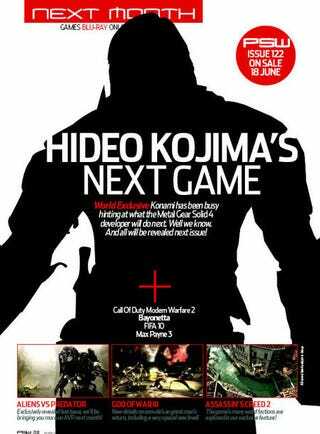 Here's the cover of a page from the latest PSW magazine, purportedly showing in silhouette the new game's main character. Of course, to get answers, PSW wants you to come back and buy next month's issue." Konami has been busy hinting at what the Metal Gear Solid 4 developer will do next. Well we know," they write. "And all will be revealed next issue!" Mmm-kay. CVG tries to answer things now. They point out the silhouette resembles the big burly lead character in the Konami title Lords of Shadow, announced last year. MercurySteam is the developer of that game, billed as an action-adventure title in a fantasy setting. So, is that the big reveal? Guess we won't know until Kojima's countdown concludes, or the next issue of PSW gets out.